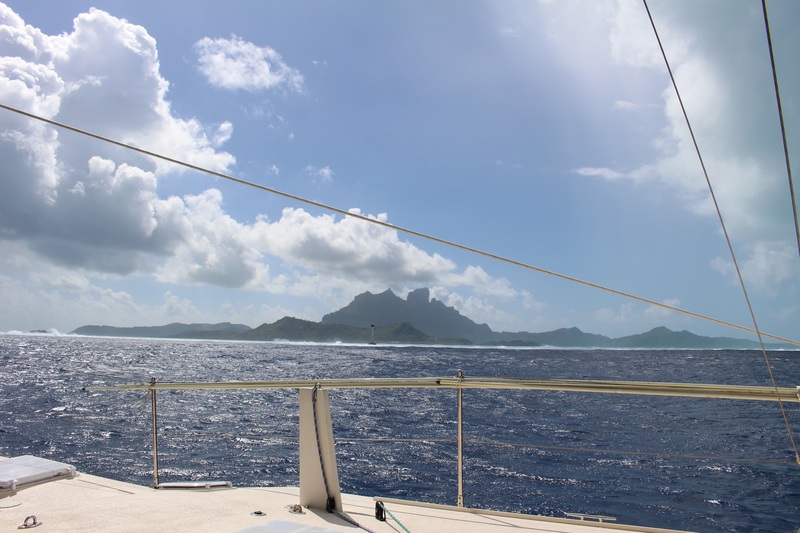 We’ve done a bunch of cruising through the Society Islands. To the town of Fare on the west side of Huahine (food shopping and expensive laundry, nice dinner ashore with Coconut Woman), south to Avea Bay (beautiful bay but got rolly at midnight when high tide seemed to let some of the waves reform after the reef), out the pass with impressive surf breaking close by on both sides, to Raiatea (anchored in five feet of water with a sandy bottom glowing turquoise for miles; Bill put out a stern anchor by carrying it out on foot!, visiting the most sacred of the maraes), into the big town of Uteroa (for diesel and gasoline and bread), sailing north to the island of Tahaa, which is inside the same coral fringe reef as Raiatea, initially anchoring in a spot too open/rolly and going back to a nice spot off a resort, snorkeling the coral garden, moving across the lagoon to a more sheltered mooring, getting a tour of the island, then a fun windy sail to Bora Bora, where we have been parked on a yacht club mooring for the better part of a week. 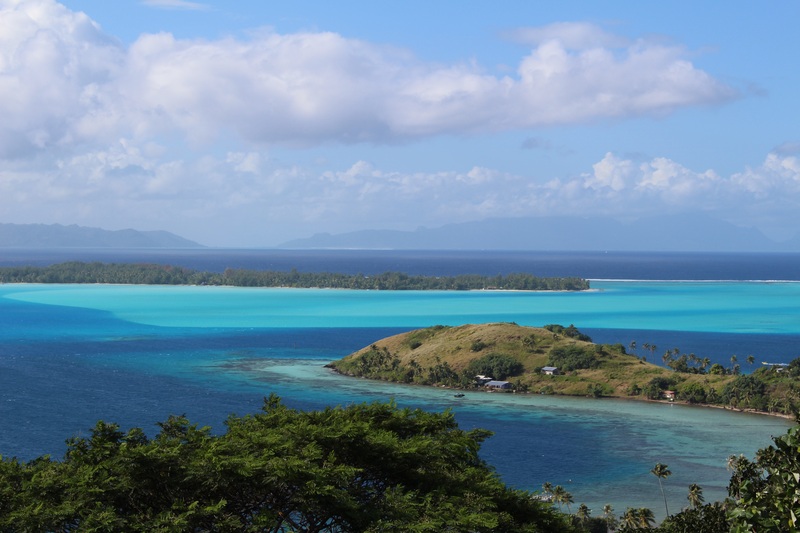 Although we were warned that Bora Bora is sometimes considered Boring Bora, I’ve been enjoying our stay. The club is nice, with a swimming pool and wifi and good (expensive) food, and less than a mile into town. Better yet is the dancing and drumming. 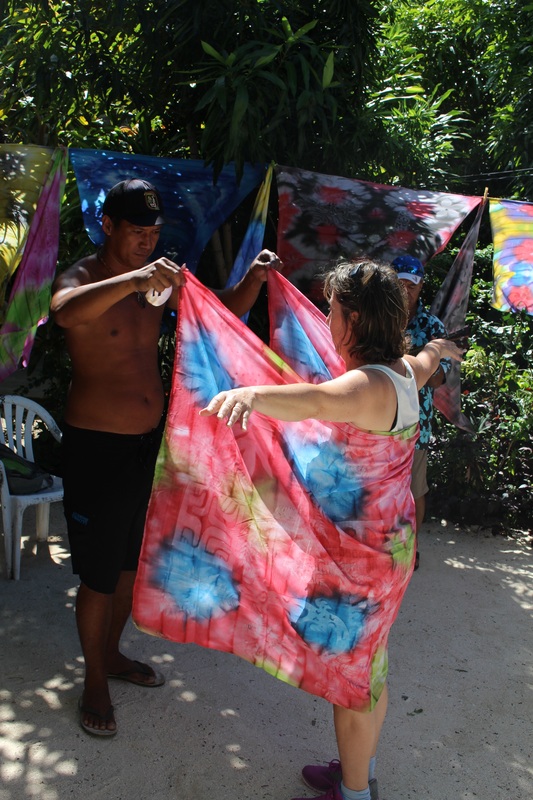 We had some dancing here at the club, which we participated in, but also the locals are practicing every night for the big annual competition in Papeete. We can hear the drums from the boat, and if we walk into town for dinner we get to watch some of the practice. Very cool. 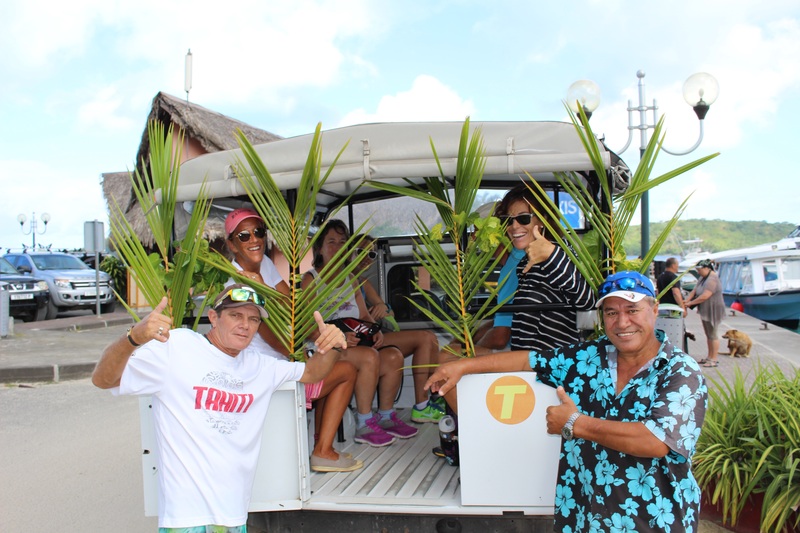 We also did a fun island tour. 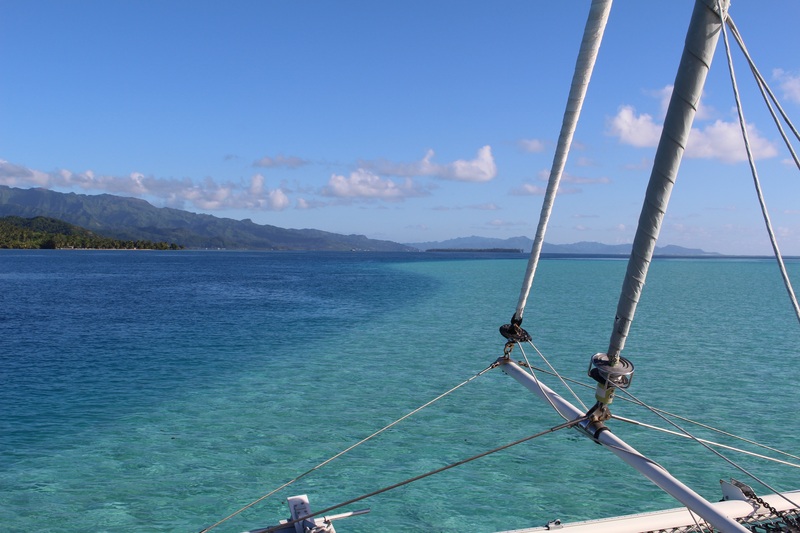 There are some alluring anchorages around Bora Bora, but at this point we are shifting from cruising mode to preparations for voyaging, so we will continue to hang on the mooring, and run errands. Here are pix from the past two weeks. 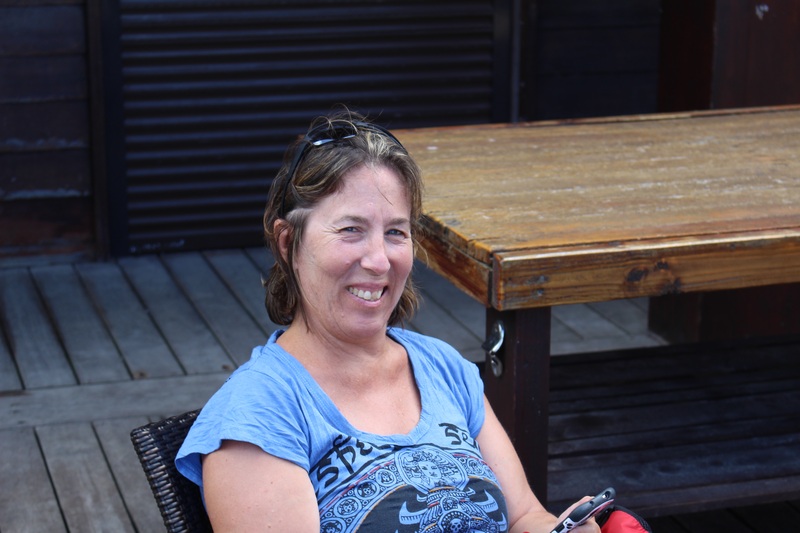 And yippee – there is wifi here! If we weren’t trying to stay close to the BPO schedule I’d try anchoring here! 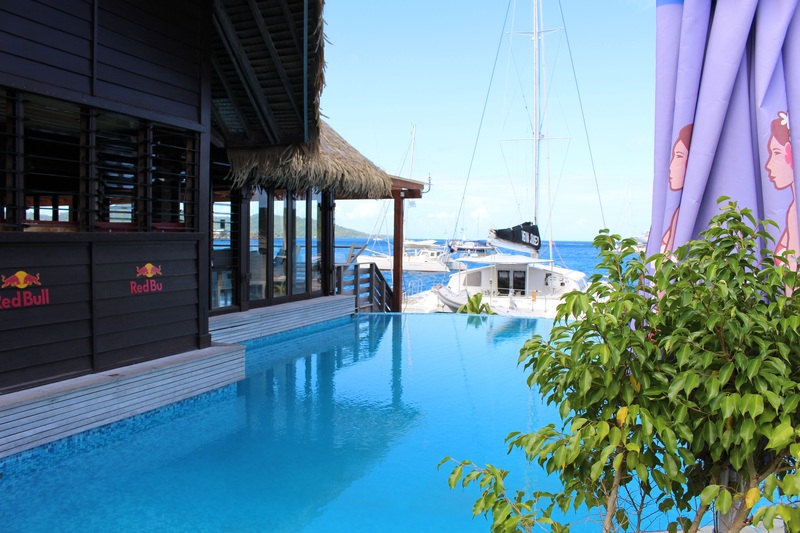 Rumor has it that the high end huts at that resort go for $15,000 per night! 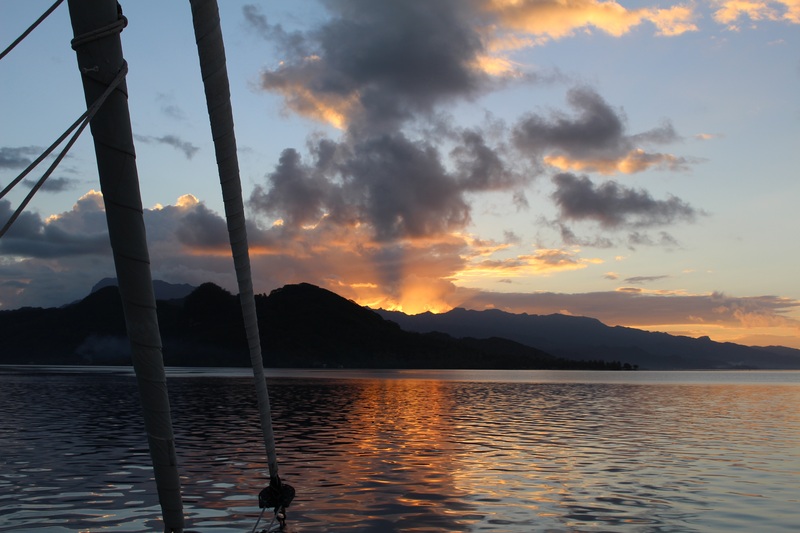 If I listen very carefully, I hear the distant whoosh of the waves crashing over the coral reef as the sun lowers in the sky just above the mountainous peaks of Raiatea. 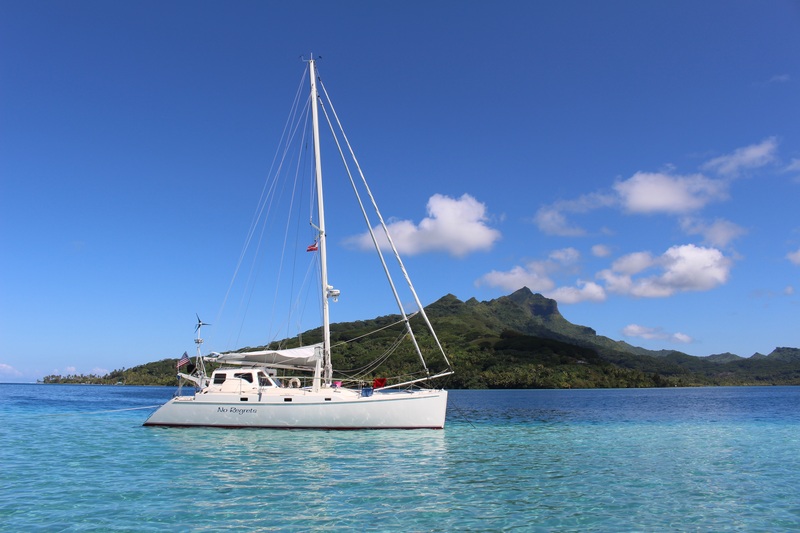 We are anchored for a second night in this beautiful bay about half-way between the island of Raiatea and coral reef that encircles the island like the other Society Islands of French Polynesia. The water is clear and calm. 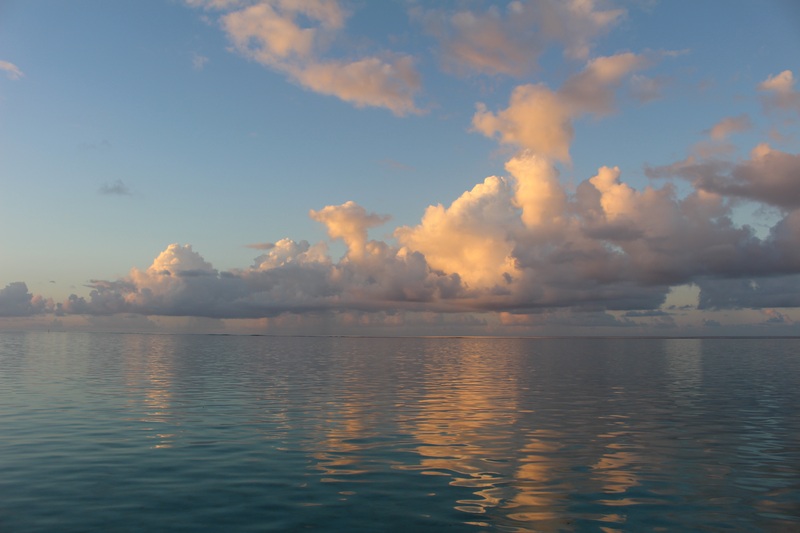 I feel such a peace and a sense of wonder when I snorkel in and around the reefs even if there are only a few fish to view. The sun sparkles on the water and the sand is white on the bottom. The richness of the blues, yellows, blacks, reds of the fishes are striking. 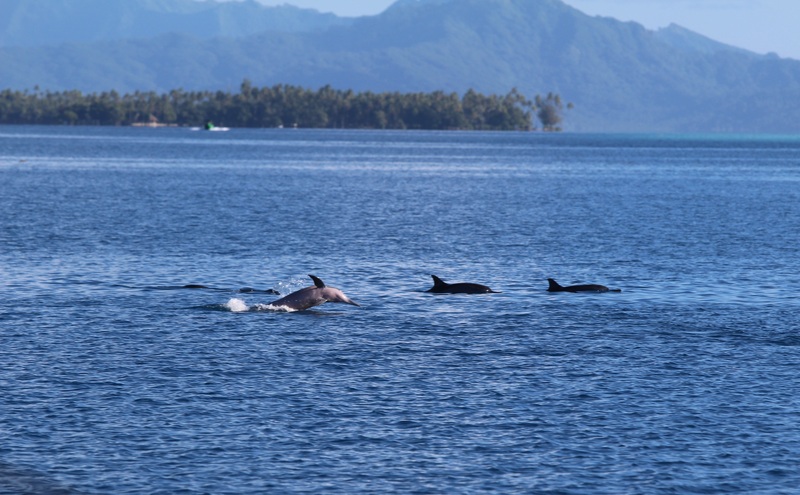 We did see a few Rays (white-spotted Eagle Ray was one) in the water as we started the anchoring process two days ago. 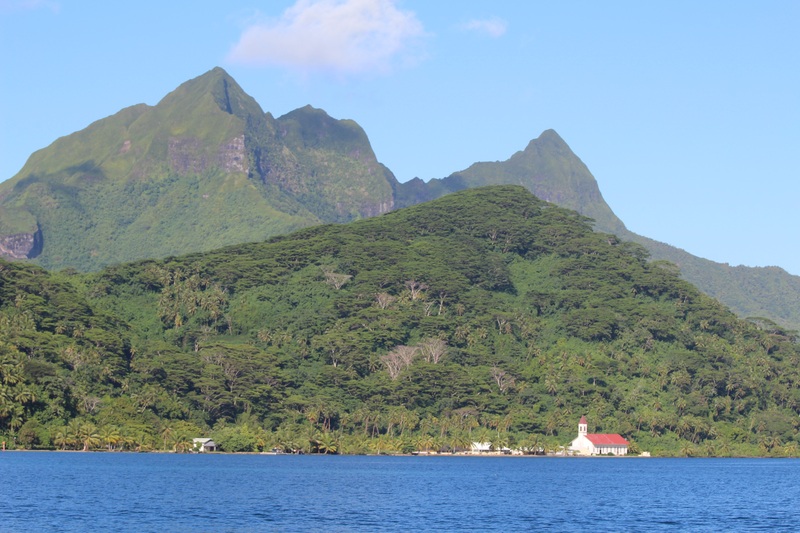 The topography of Raiatea is mountainous with many peaks like the island of Mo’orea. Trees fill in the peaks with mostly palm trees lining the shore. 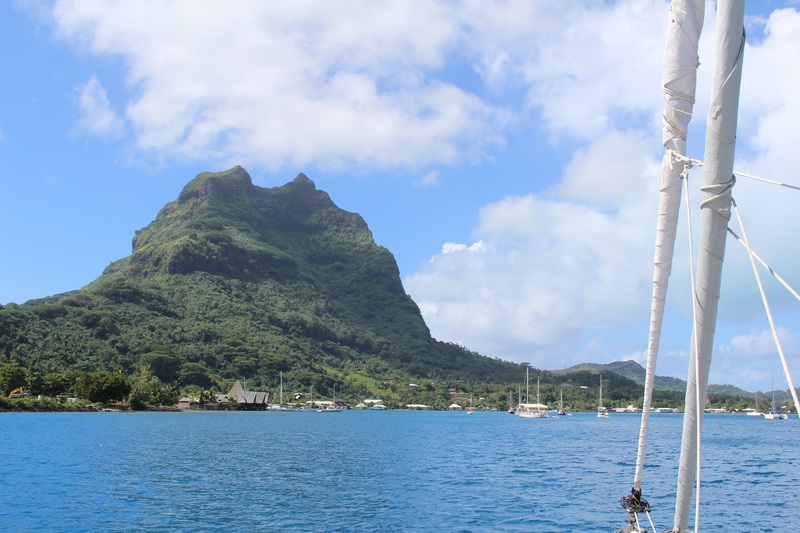 The anchorage in Mo’orea, the mouth of Opunopu Bay (had to ask Zeke for the name and spelling!) 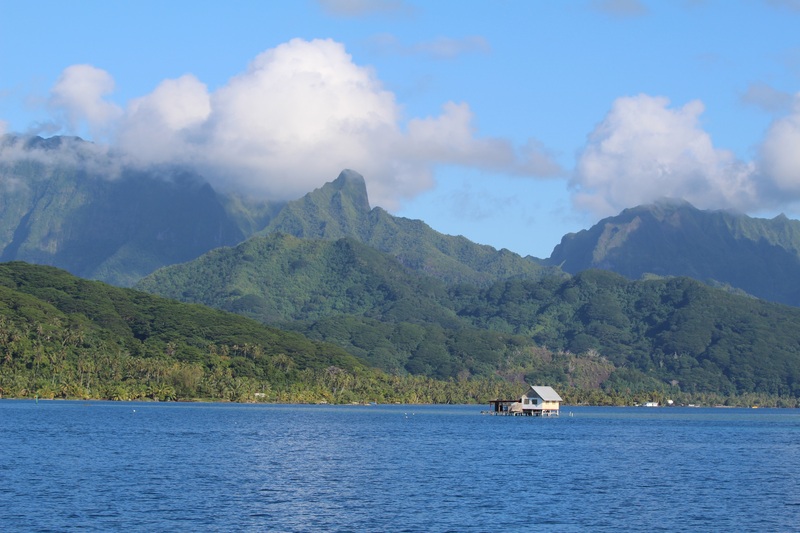 had a spectacular view of the even higher and more dramatic peaks than Raiatea. 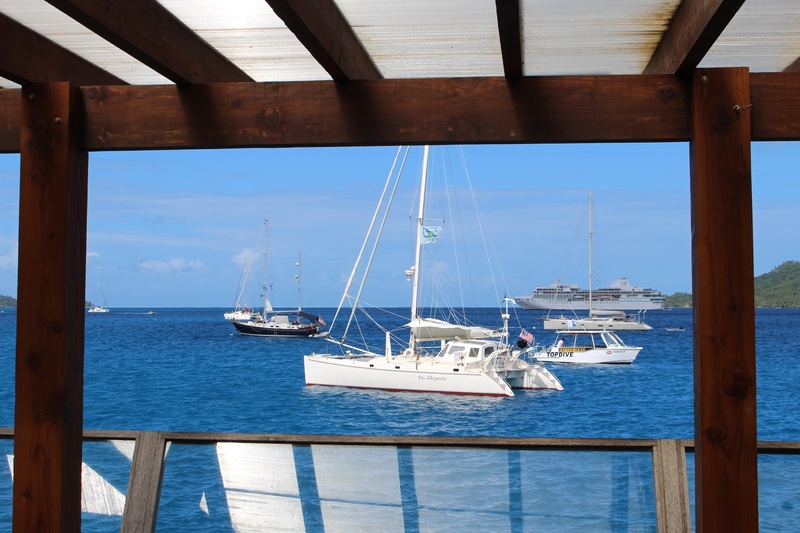 Even though we were in the middle of two resorts with various motor boats, the beauty superseded all of it. I enjoyed watching each day the local sailing school of about 8 hobie cats with three to four kids on each boat with their colorful sails, the kids’ shouts and laughter as they sailed by and the continuous shouts of commands in French by their instructor who leads them in a small dinghy. 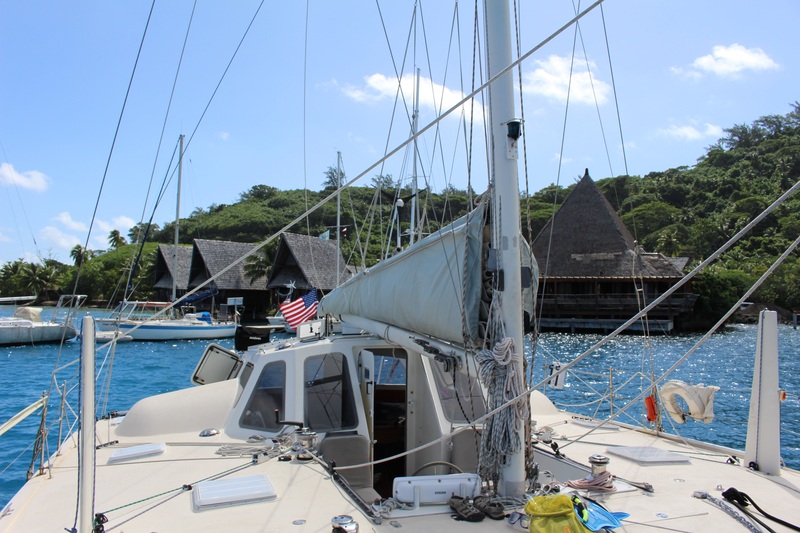 We met other USA boats who have been cruising for 10 to 15 years in French Polynesia! 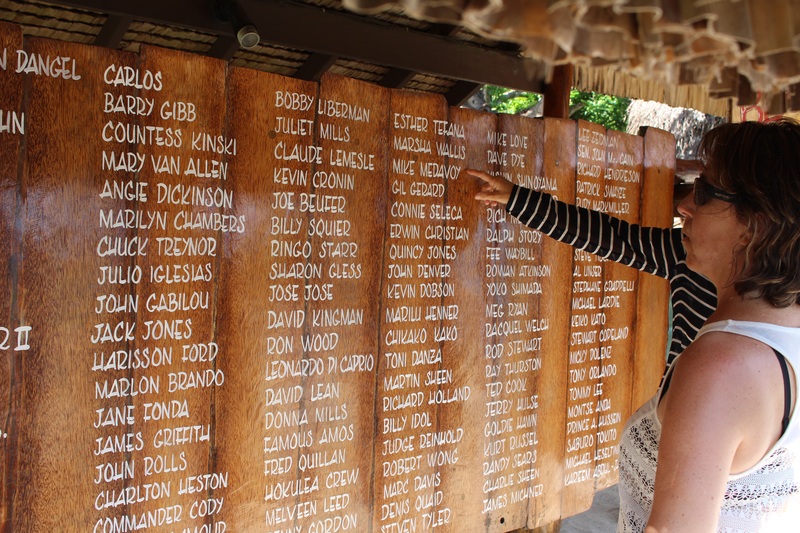 Going back in time to the first time I saw his face…After I went through immigration at the airport in Papeete, Tahiti, I spotted Zeke above the crowd. I waved high and wide at him! 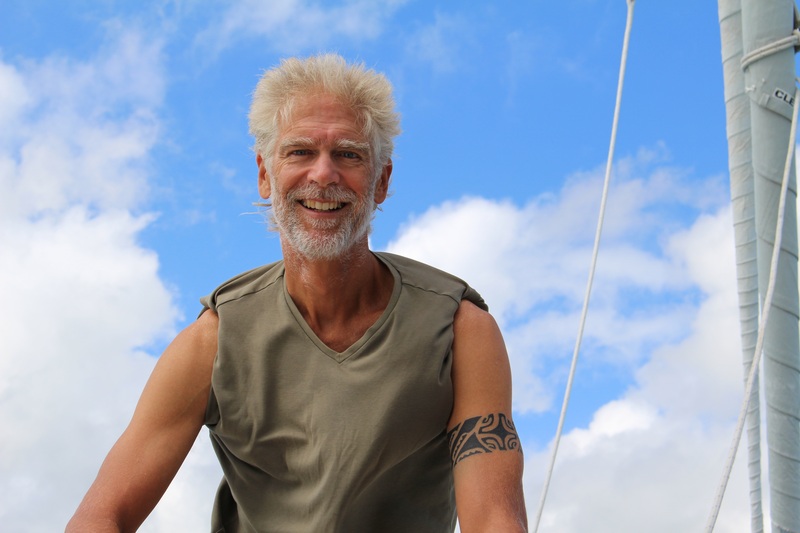 He had long whitish hair but what was most striking was his very long mostly white full beard! 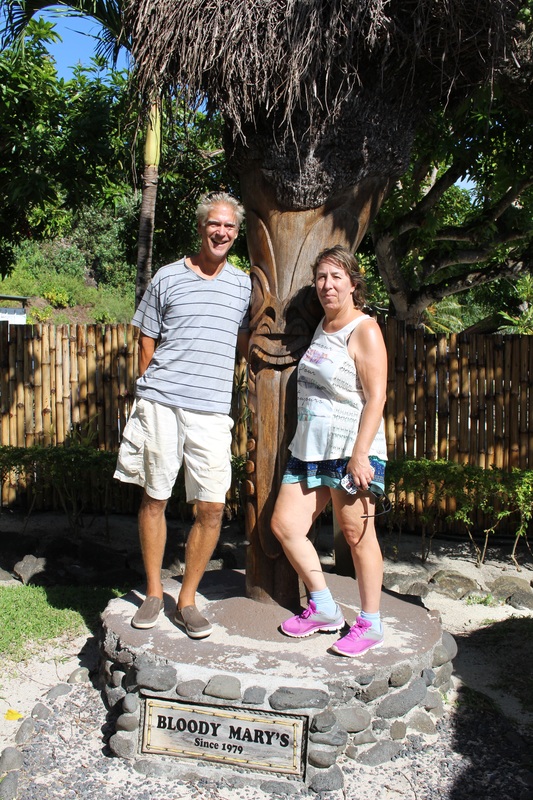 The hosts of the Air B&B were waiting to take us back to their apartment in Papeete where we stayed for the next three nights. The high heat and humidity was intense. I thought a room with a fan was going to be fine but not so much. The nice shower made up for it a bit but only a bit! I knew I needed to choose to slow down and take responsibility for my own well-being by looking for ways to accept the heat, keep cool on many levels and still have fun. I can say I did well! 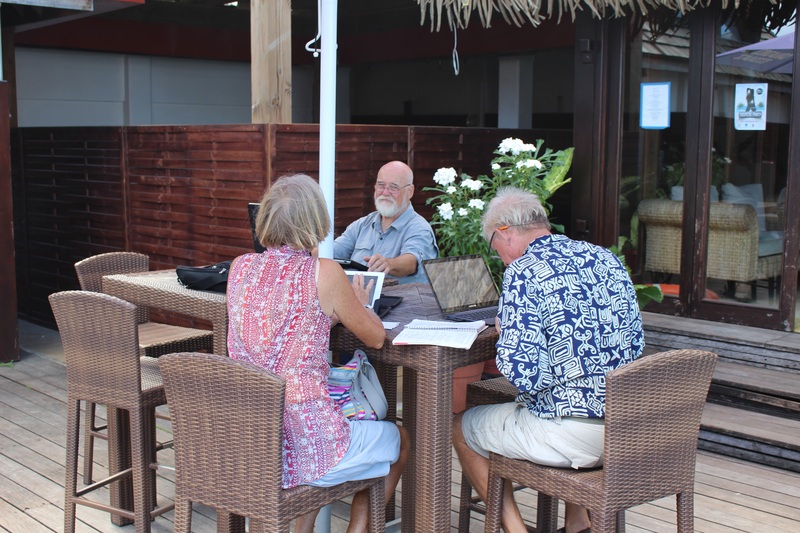 My first impression of Papeete was how HOT it is so staying on the boat in a marina with no wind took some getting used to. There are fans on the boat but no AC. 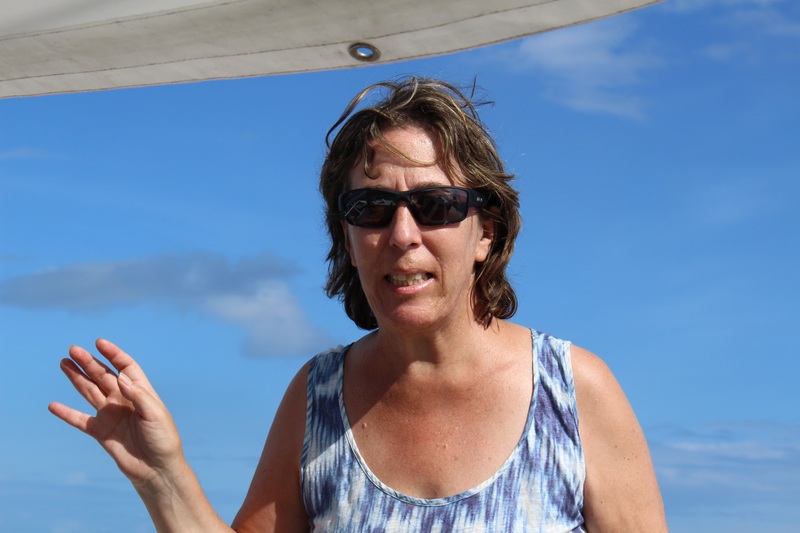 Many BPO boats have AC. 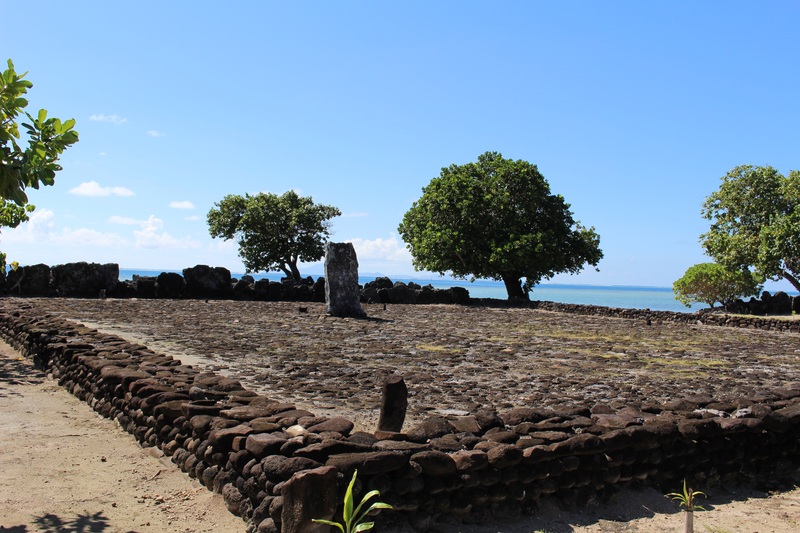 The city of Papeete is kind of run down and dirty in most places but there were pockets of beauty and quiet and some lovely interactions with the locals. Bill discovered these three open air restaurants (most are open air!) and we had to walk through this beautiful park to get there. Families hung out there in the evening. It was very well lit and beautifully kept. 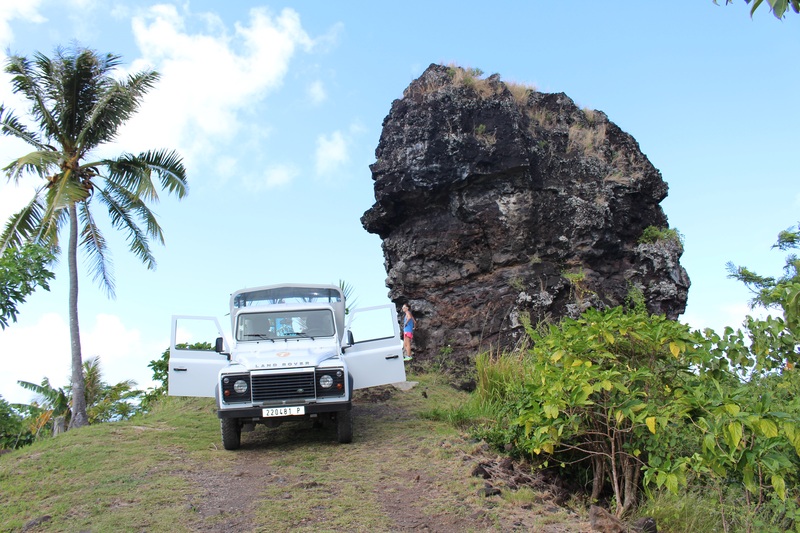 Zeke and I rented a car and drove around Tahiti Nui and Tahiti Iti and we found the highest peak for a beautiful view. 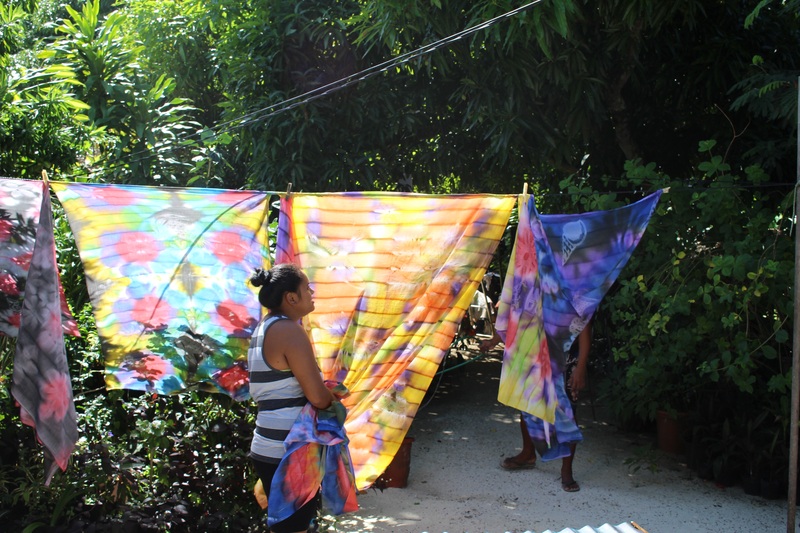 I enjoyed interacting with a local Tahitian woman at the open market who sold various jewelry. She was very sweet and helpful and had a beautiful warm smile. 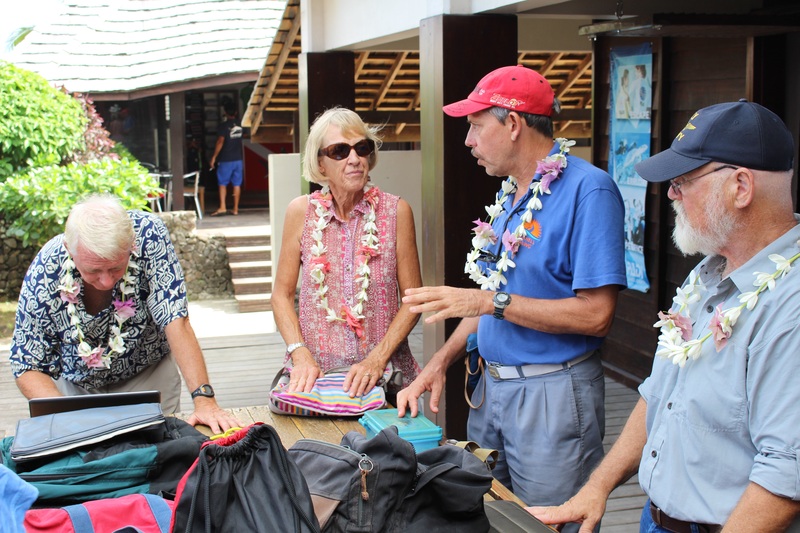 We have found all local people so far in the Society Islands to be helpful, warm, friendly and seemingly happy. It is frustrating to not speak Polynesian or French but we usually found ways to communicate. I began to engage more and more by asking how to say something in French. I began greeting people in French. 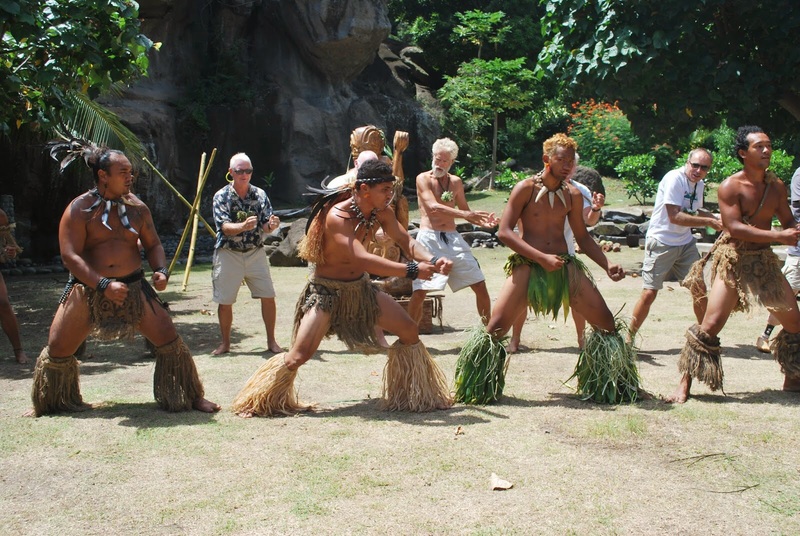 The Polynesian language and traditions are not as prevalent now unfortunately but here and there you see the traditional dances and music performed. 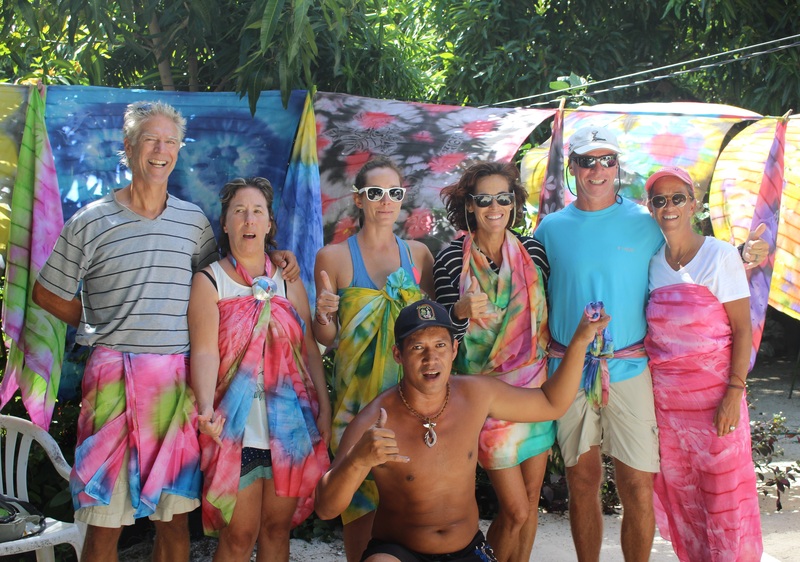 The Tahitians during a holiday made these beautiful flower head wreaths!! Many Polynesian flowers are very fragrant. 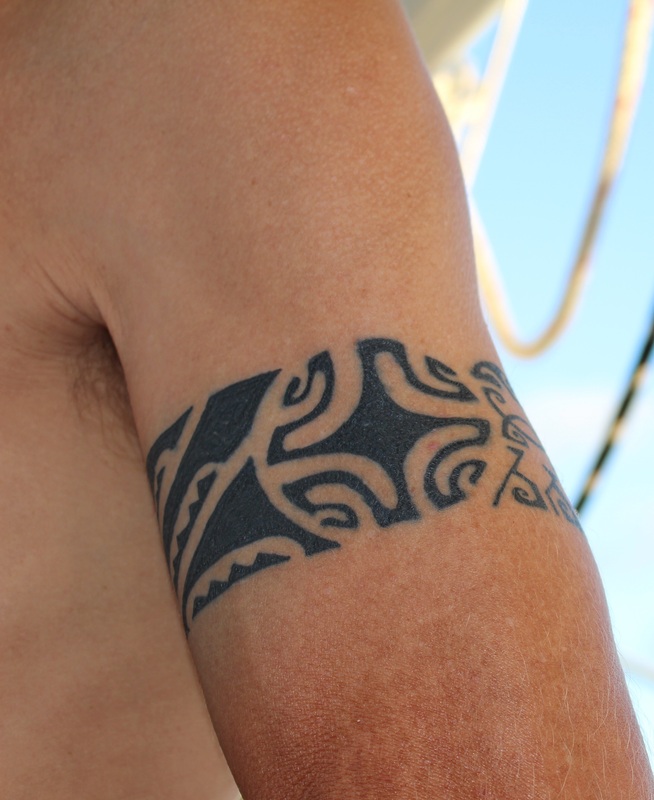 The people of French Polynesia are very proud of their traditions. 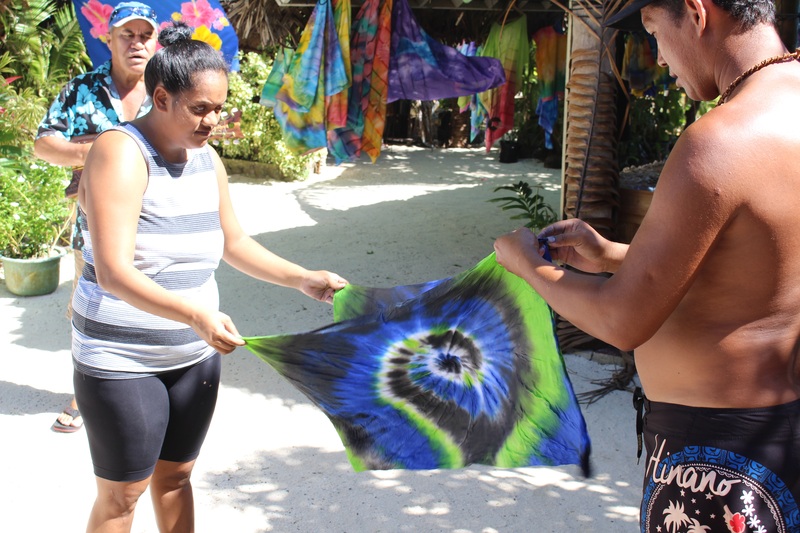 It seems that even the young people honor the Polynesian traditions that we have witnessed in their traditional dances, drumming, and singing. 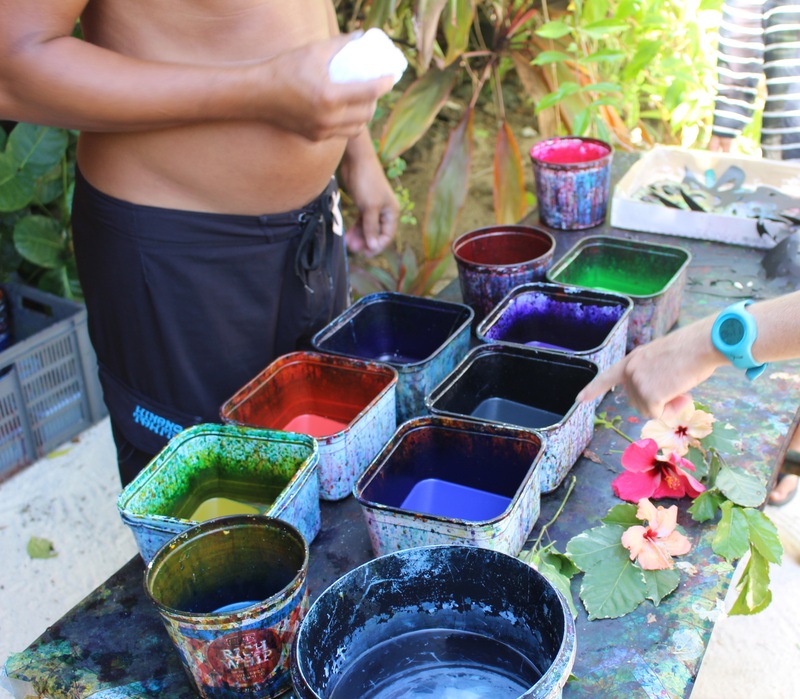 Many communities have been practicing for a major competition that is held annually in Polynesia. On Bora Bora, we have gone to watch rehearsals of the dancing and singing along with the drumming and music. The drumming is so primal and powerful and the women move their hips to the beat of the drums. The singing is sweet, soft and fluid. All of it emanates joy and love and beauty. 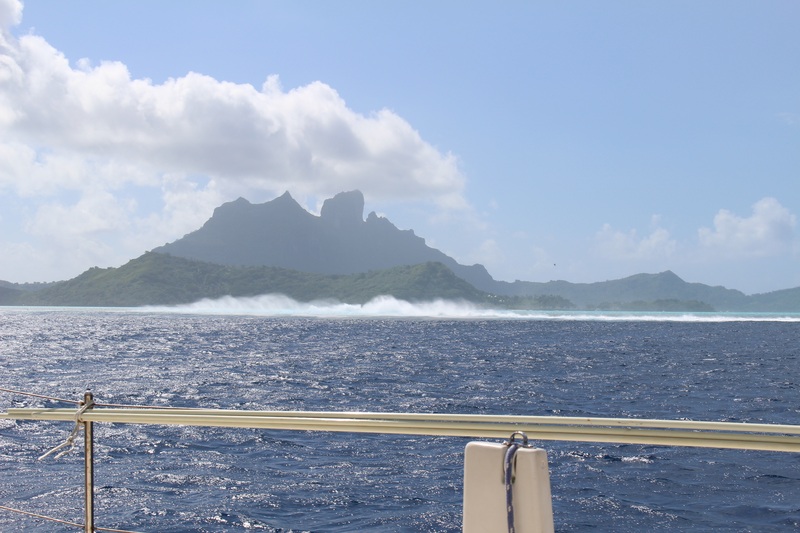 I have been in Bora Bora for 5 days on a mooring at the MaiKai Yacht Club. Nice amenities like a swimming pool with the view of the water and peaks. 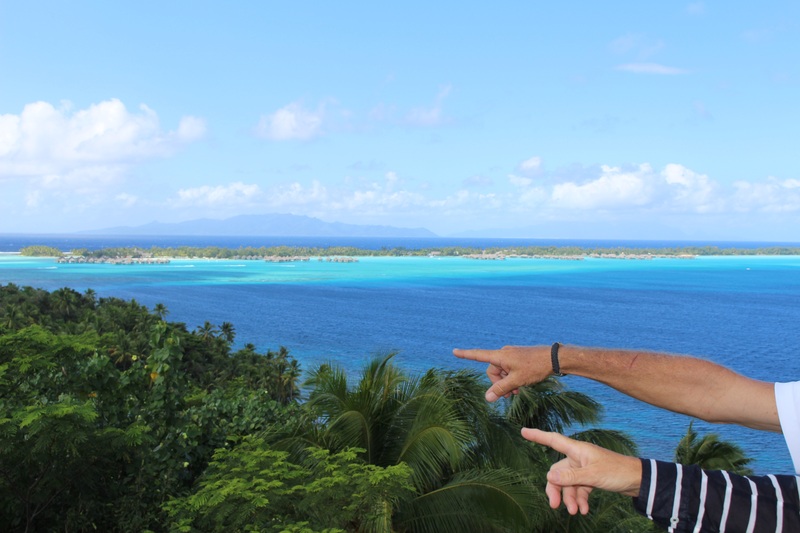 We discovered that there is only one close to white sandy beach in all of the Society Islands and that is a public beach in Bora Bora. 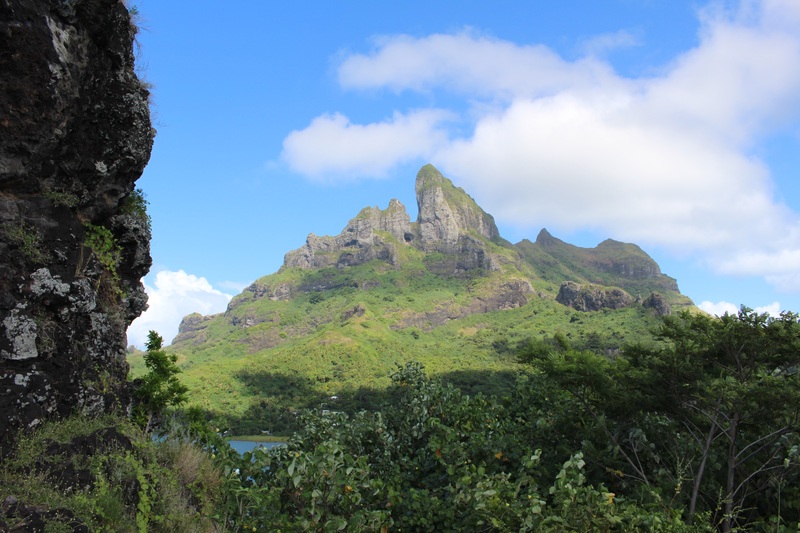 The most striking and extraordinary physical features of the Society Islands are the peaks and their many jagged edges. And, yes about five 5-star resorts with those water huts ranging from $500-$15,000 a night! 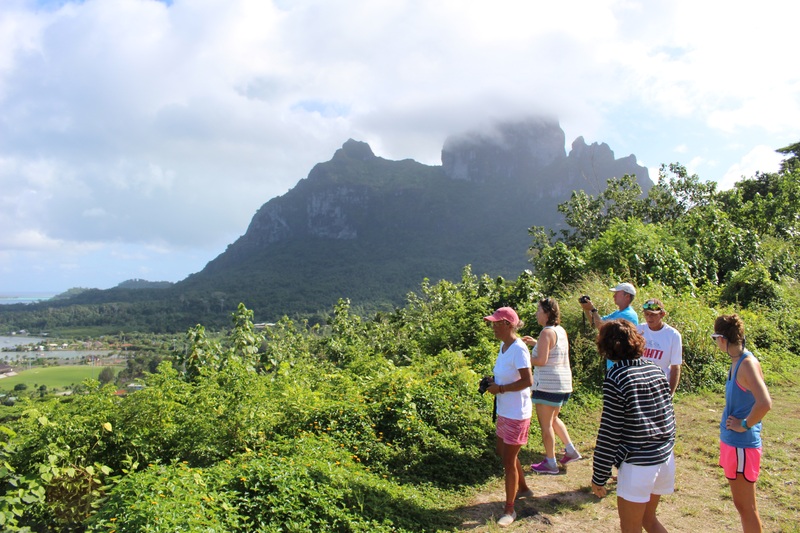 We took an island tour yesterday and the views were breathtaking. All the blues and greens in the water are just gorgeous! We ate fresh coconut and sipped its juice. 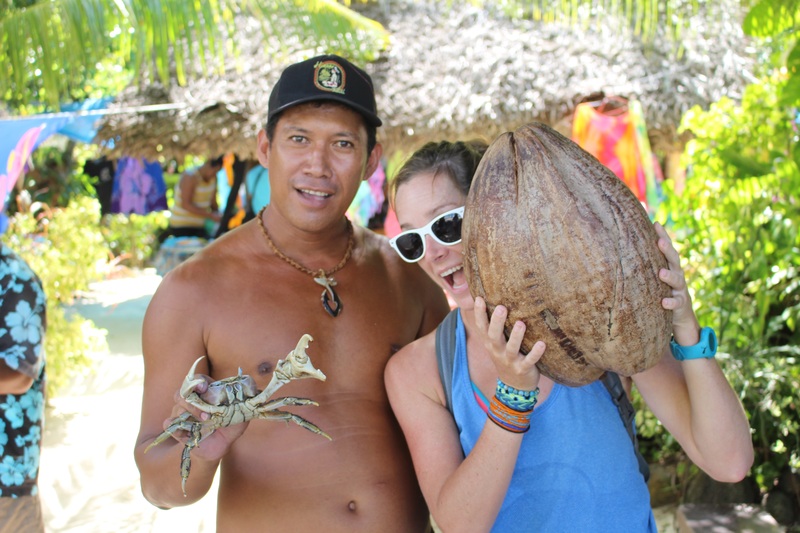 There are coconuts, pamplemousse, bananas, mangos and papayas galore everywhere. Zeke is already planning and prepping for the next phase of the BPO but I refer you back to his blog for details. We are together at the pool and will do a few errands and like most days see what we do as the time comes. I did plan to at least begin packing today but midday sun and heat does not lend for packing down below.